If you’re finding that your face keeps coming up in blemishes, especially in areas where you brush on makeup, such as on the cheek bones, it could be sign that your makeup brushes aren’t hygienic. Keeping them in your makeup bag among all the leaking foundations, concealers, mascaras and anything else you have in your collection means they’re in among the germs, and won’t be clean when you apply your makeup - dirty makeup brushes are a sure sign that you need a makeup brush holder. Makeup brush holders are also a handy place to store makeup brushes so you don’t lose them. Knowing where they are all the time means you can be certain that you’re sibling must have ‘borrowed’ one if it suddenly decides to go walkabout. You may also find that your makeup brushes go flat after a while, so keeping them in a holder will make them last for longer. When looking for the best makeup brush holders consider what you need - do you want a holder that focuses more on delivering insta-worthy style than it does the amount of storage space that it offers you? Have you got a collection of 20 different brushes that need a home, or do you want an enclosed pot that stores just a few? We’re pretty sure you’ll find the perfect makeup brush holder for your requirements in our selection below. If you’re looking for a professional looking makeup brush holder that’ll look super stylish on your vanity cabinet, the sleek, black acrylic of this holder makes it a great one to choose. N2 Makeup have really thought about things when it comes to delivering an appropriate storage solution with the size of the holder and the amount of slots carefully considered. Reviewers seem to love the design and quality of the product, so in terms of ticking the boxes, this one does it’s fair share - certainly worthy of a number one space. This clear acrylic makeup brush holder stores a good amount of brushes in its two brush slots. There’s also two slots for sponges and one for lipstick or whatever you see fit. Lifewit have creatively used pearl beans as a support mechanism for your brushes, making the brush holder a smart feature for your dressing table at the same time. Reviewers constantly compliment the appearance of this brush holder, while the dust-proof exterior is certainly an added bonus. Who says a makeup brush holder needs to be fancy and expensive? This pocket-friendly, multi-purpose rose gold brush holder does a good job of being stylish, promising elegance and attractiveness. With Caveen aiming to create a rust-proof, rust-resistant, sturdy and durable holder, you can be sure that it will provide many years of service - you could even use it to store brushes one year and your cooking utensils the next! A cylinder alternative to the marble makeup brush holder we featured earlier, this one is slightly girlier, yet it will make a stylish addition to any dressing table. With the choice to use it as two separate pots or as a covered carry case, it’s up to you whether you store lots of brushes or just a couple. It’s also interesting to know that Luxie operate vegan ethics, so if you’re that way inclined not just in the way you eat, this is a great option. Available on Not On The Highstreet, this isn’t your average makeup brush holder. Made from stunning leather, size isn’t the overwhelming feature of this bag but if you’re looking for designer finesse, Maxwell Scott Bags suggest you’ll find it right here. Boasting that this bag comes from one of the most renowned tanneries from the heart of Tuscany, the brand say you’ll benefit from the strict standards and quality checks. While small, it’ll fit perfectly into your handbag and you can personalise it. If you’re looking for a pocket friendly makeup brush holder that does the job, this one is for you. Available with a range of coloured bases for that personal design feature, it’s the perfect size to store makeup brushes whether on a bathroom counter or your vanity table. Reviewers seem to compliment the appearance of the holder, although some suggest it is a little on the small size for those with lots of brushes. 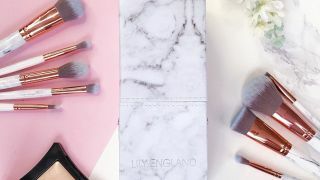 If you like the idea of a personalist makeup brush holder but don’t feel like paying out as much money as the 6th product on our list, this is a great alternative. Yes, it’s no good if you’ve got 20 million makeup brushes; but if you’re looking for a home for your blusher brush, your bronzer brush and your foundation brush, the three slots of this wooden hexagonal sculpture provide the perfect storage solution. If you’re looking for a gift, ask MIJMOJ Design to carve the desired name into the wood. If you’re struggling with present ideas for your teenager, this ceramic mug-style makeup holder could fit the bill. With a motivating message, it may inspire them to think about their future success. Made from high quality ceramic and promising to be completely dishwasher proof, this is a convenient makeup brush holder that should last for many years… or until they become too grown up for it. If you are in need of more storage for your cosmetic kit than just a brush holder, our guide to the best make-up organisers will help you out.